I’ve been a Sims fan since I was just under five years old and played my mother’s copy while sitting on her lap. When The Sims: Makin’ Magic was released I bought it on release day and have since bought every game in the series on release day too and have been semi-active in the modding community since the release of The Sims 2. After playing the game for a couple of days I’ve decided to crank out a detailed review for those who didn’t quite feel that EA’s bizarre marketing campaign gave them enough information about the game to make a decision as to whether or not they wantto buy it. Features-wise, very bland. There’s just not a lot to do in this base game. Even with the inclusion of nightclubs in the base game types of community lots tend to blend together in function. Even compared to the Sims 2 base game, there just doesn’t seem to be a whole lot to do. Function-wise, the game played really, really well for me. In about 20 hours of gameplay I only ever came across two pathing errors that forced sims to drop everything they were doing because they couldn’t get somewhere, and both times this was because of two sims trying to get to the fridge at the same time (though, admittedly, I don’t think this was really something that should have been overlooked that easily). I have yet to experience any freezing or stuttering in my save file and I have yet to find a reason to whip out resetsim like I had to do extremely frequently in Sims 3. The new multitasking system works surprisingly well and I was almost surprised when I directed my sim to leave a conversation to go cook a meal and she continued talking while at the stove while the other people chatting were still watching TV. My personal favorite combination of interactions is that sims reading a book can go to the loo at the same time. The default camera controls are bizarre and unintuitive, but the game thankfully comes with an option to return to Sims 3 controls. The game is a fair bit more stylized than its fellow PC predecessors. The sims themselves are a lot more cartoon-like than before, which seems to have been hit or miss with a lot of people. The detail present the vanilla textures is incredibly low, which is especially noticeable in the grass textures of Willow Creek, if you’re looking for a particularly egregious example. 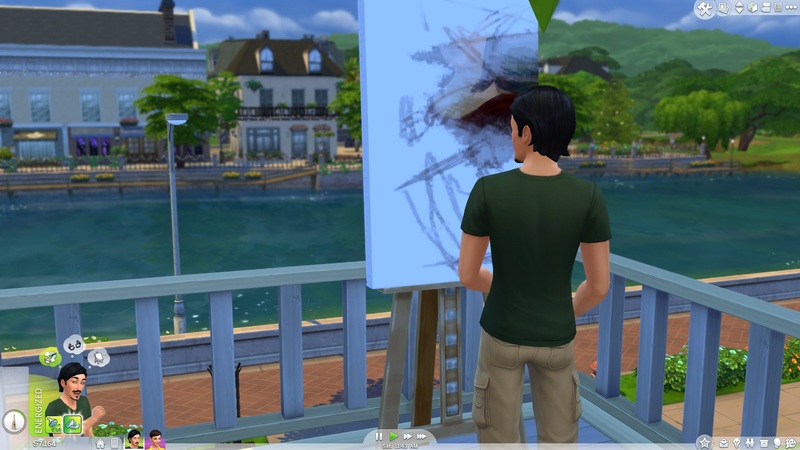 The sims themselves are also affected by the low texture quality and not only do none of the vanilla hairstyles utilize alpha mapping, but alpha maps are also completely disabled for all hairs, meaning that converting many hairstyles made for older games to The Sims 4 engine is going to be even more work than it has been with past games. An example of the exterior lighting. The exterior lighting is positively gorgeous. Unfortunately this is balanced out by the terrible interior lighting. The devs seemed to start out with a good idea for the lighting system, as each light source included with the base game has it’s own shape and intensity of light cast appropriate to how that source would function in real life, but it just doesn’t seem like it’s very balanced and it requires an absurd amount of light fixtures to light a room well. They also implemented possibly one of the only depth of field effects in video games that I didn’t hate. The only thing it affects is the distant lots and terrain and even then, if you don’t quite like looking at the the world as though you’ve been crying, there’s already a mod for that. 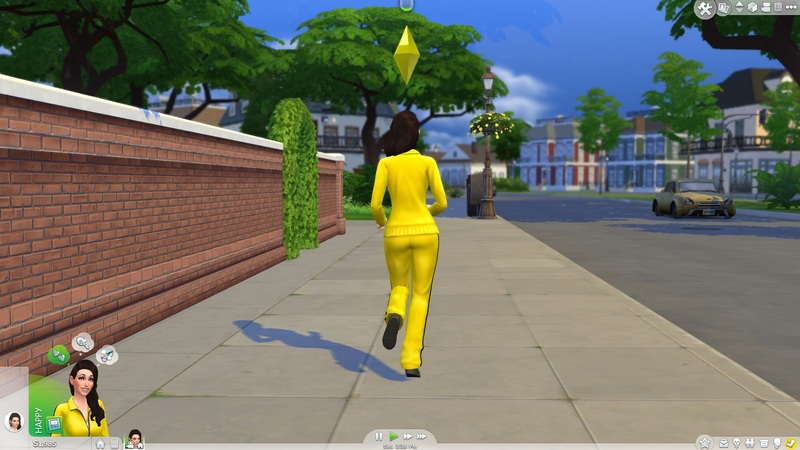 As for the animations, I’ve noticed a definite improvement over those of the Sims 3. Most of this comes from the quantity of animations, as the Sims 3 reused animations a lot and forced sims to go through the whole animation of an interaction before allowing the sim to stop performing an action. One of the primary things I’ve noticed with the Sims 4 is that even interactions that can be done sitting down perform seem to have animations for both the sitting and standing positions. Altogether, the Sims 4 has a very distinct visual style, which might not be right for everyone, but the style remains very consistent throughout the whole game. There are problems with the lighting but the development team has already commented that they are starting to rethink how they designed the lighting system based on player feedback, so this might not be all there will be to it on that subject. Meh. None of the built in stereo channels are anything special, except for the Retro channel which only seems to be available on more expensive stereos and plays music from past Sims games. Every time a sim’s emotion changes a short jingle plays, which gets very, very old after not that long. Unlike the Sims 3, we can now add custom music to any channel we want but there’s no word yet on whether or not we can create completely new channels. 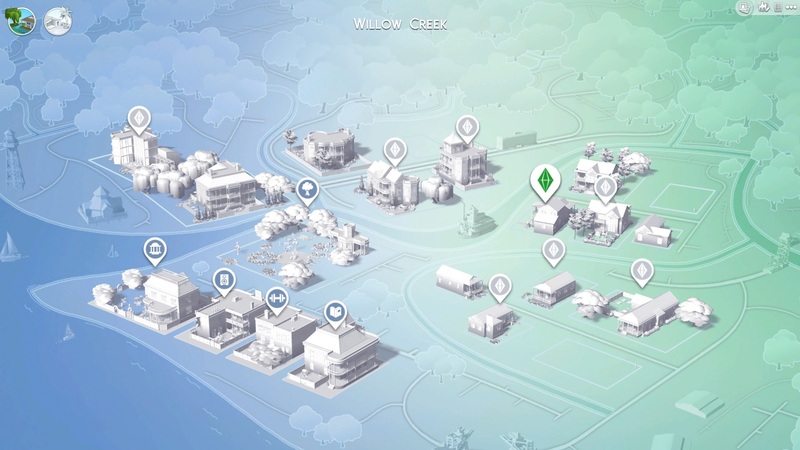 That’s right, the open neighborhood introduced in the Sims 3 is gone, replaced with a new system of worlds and neighborhoods that allows your sims to roam the area nearby their current lot (although travelling onto an actual neighboring lot requires a short loading screen). There are pros and cons to this absence of an open world and I’m having trouble so far deciding which system I found to be more enjoyable. Sims 3’s open world was was a great way to travel the world, and solve the problem of some of a household leaving to go to another lot and some remaining at home and figuring out how to deal with both groups for the duration that stayed housemates stayed out, as the games could only ever focus on one lot at a time. The Sims 1 and 2 dealt with this by having time on the home lot would when a group of sims traveled to a community lot. This was both frustrating and easily exploitable, as through the use of community lots a player could make a single day infinitely long and the only thing stopping a sim from staying out forever was the inability to sleep on community lots. The Sims 3 fixed this with its open world system, which naturally had time pass equally for all areas of the world and allowed the player to focus on any lot that they wanted to, even if they had no active sims there at the time. Sims 4 has its own fix for the problem: allowing us to set “away actions”, general tasks, such as cleaning the house or just relaxing, for our homebound sims to do while we play around on community lots, allowing time to move forward on the home lot just as it does on the away lot. An issue that the Sims 3 had with its open world was the amount of processing power that it took in order to run the entire neighborhood at once, which throttled the amount of sims that the game would place on community lots, resulting sometimes in things like eerily empty nightclubs. With the absence of an open world comes the return of the dreaded loading screens to the Sims gameplay. There are loading screens between different lots and to go in and out of CAS and, of course, to get into the game from the main menu to start with. Although they’re frequent, the loading screens are surprisingly quick. I did an experiment in timing the loading screens in between the main menu and the loaded game in base game Sims 2, 3 and 4 on my machine several times and then averaged out the results. My conclusion? They’re fast! Even faster than those of a game ten years older. I really miss the open world of the Sims 3 but I’ll admit that it did bring with it problems that perhaps showed that the series just wasn’t quite ready for yet. Loading screens are still an annoyance in the Sims 4, but if loading screens are a necessary evil I think I’m pleased with just how well they seemed to be implemented. The Sims 4 base game is rather bland for features and barely beats the Sims 2 base game. There aren’t a lot of careers to choose from and neither are there many aspirations and I’m not sure I can really see myself playing regularly after the first few weeks. BUT my experience with this Sims game has also been a lot more stable than I had with the Sims 3 and I have admittedly been having a lot more fun playing the game than I expected just messing around with the new features. All in all, I’m enjoying what I’ve seen of the game so far and look forward to continuing playing it again. I can’t say for sure how long it will continue to be interesting for me without an expansion, but I’ll probably consider buying the first expansion a lot more than I did with the Sims 3 after having a base game this stable.